The humanist Bonaventura Vulcanius (or De Smet in Dutch) (1575-1614) was a genuine networker. But how does one create a network without the modern means of communication such as Facebook, which we are using today? Vulcanius did this by starting two alba amicorum. Many contemporaries wrote friendly messages, and notes) on the meaning of scholarship and humanism in these albums. Vulcanius consciously used the albums as a tool for public relations and as a means of publicity for his own purposes. The album of Vulcanius which is kept in the Royal Library of Brussels, is the perfect example of the competition for the most clever inscription: composed in for the greater part in Latin, Greek and Hebrew, it outdoes every other album by its quantity of rare texts extracted from the classics or the church fathers! In its 103 inscriptions only two drawings break the repetitive assault for cleverness. Vulcanius was a humanist without borders: he lived and worked in The Netherlands, Spain and Germany, and, in the year 1577, was secretary to Philips of Marnix, lord of Saint-Aldegonde) in Antwerp. In 1581 he was appointed professor in Greek at Leiden University. He was to hold this chair until his death in 1610. Vulcanius was also secretary to the Senate of the University, a crucial and influential position within this governing body. During his lifetime, Vulcanius sold parts of his personal library to the University Library. His collection of books and manuscripts is still one of the most important collections of this library. 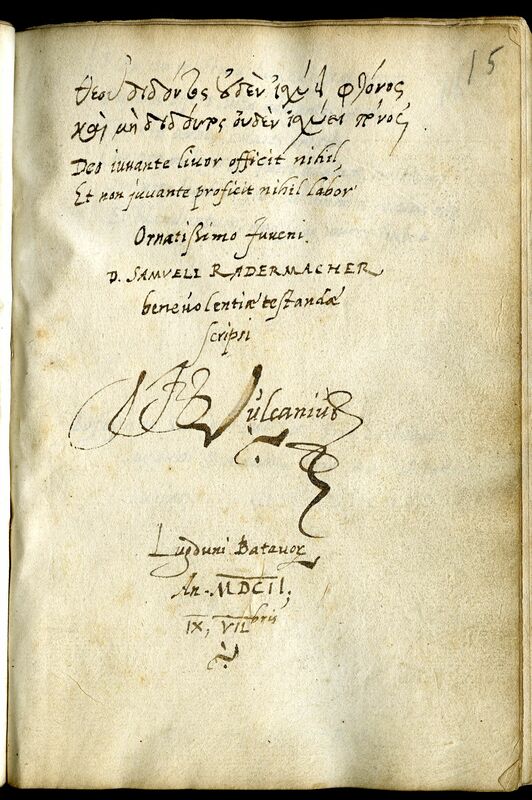 Vulcanius can be considered one of the most important figures within the framework of sixteenth-century humanism in Leiden. Leiden University Library holds a large number of alba amicorum in its collections. The greater part of the thousands of poems, biblical quotations and mottos was written by students, scholars, physicians, clerks, ambassadors and political figures who represented themselves and their social networks in these alba. Most of the inscriptions (sometimes accompanied by drawings and coats of arms) are declarations of friendship, collected from a motto, a religious quotation or a poem. An album amicorum is a public recognition and declaration in itself. The exhibition 'Facebook in the sixteenth century? The Humanist and Networker Bonaventura Vulcanius' is on display from 14 October - 12 December 2010. An online version is available in Leiden's Digital collections.